I wasn’t a fan of chicken livers as a kid. Not at all. But as an adult, I am finding them more and more appealing, if properly cooked and not those rubbery, hard and sandy tasting nuggets you often find in restaurant or carinderias these days. Bad examples make me think of eating large pencil erasers with sauce. :) I did a great Kylie Kwong recipe for sauteed chicken livers a couple of years ago, and have used that recipe several times since. 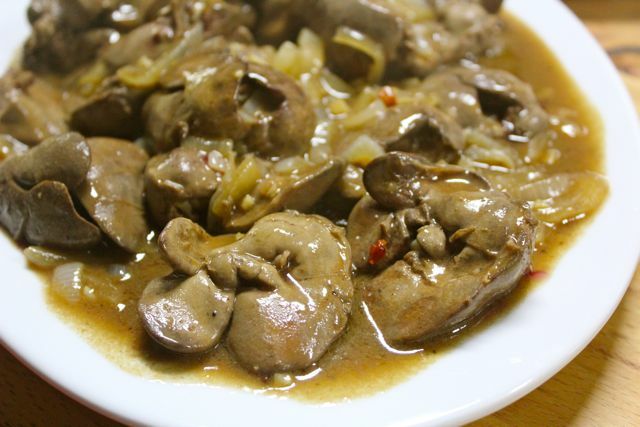 Today, for an office lunch, I was trying to figure out an easy, nutritious and economical dish to make and ended up with this platter of sauteed chicken livers with lechon “gravy” that was wiped clean in minutes. Definitely a successful experiment. 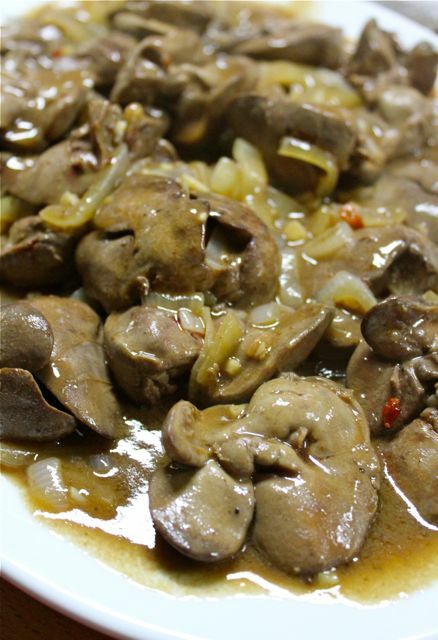 Perhaps you might want to use chicken livers instead of fish in that Cha Ca La Vong. I think it’s going to work amazingly well. After all, chicken liver salad is a French classic. A friend told me a story of butcher in Bacolod who loves to stab/puncture a leaning lechon and catch the drippings in his plate of rice. Ouch. That “lechón” gravy (delicious as it may sound) kind of kills it, doesn’t it? The general public needs to understand that ingested fat and cholesterol does not make one fat and have high cholesterol. There are other factors involved. Cholesterol is not the cause of arterial blockage, it is the symptom. Cholesterol accumulates there because it is the body’s ‘band-aid’ (plaque) over inflamed arteries. Inflammation of the arteries is caused by chronically exposing the body to injury by toxins or foods the human body was never designed to process. Such foods include unnatural, processed low fat products, those high in polyunsaturated fats and simple, highly processed carbohydrates. Excessive consumption of omega-6 vegetable oils like soybean, corn and sunflower found in many processed foods is the silent killer, not butter, lard or coconut. The more inflaming foods are consumed, the more “frayed and fragile” arteries become, the more plaque builds up. The public has been fooled for far too long and sadly still is. Khew, your point about polyunsaturated fats is interesting. Don’t they become harmful only under certain conditions, eg, oxidisation? EJ, these fats are not very stable and most of the time, they are consumed cooked and thus become oxidised and destabilised. The splatter from such oils form a rubbery gunk on kitchen surfaces when they’re left to cool and not cleaned away immediately. Imagine what happens when they’re in our bodies. The only time I use such oils is when making mayonnaise, ie, uncooked. Even then, only sunflower oil and it’s usually a hit and miss affair as at times the oil smells oxidised or with a not so palatable odour. Corn oil seems to be the most neutral of all, while soyabean oil smells of paint at times. Then there’s that questionable rice bran oil and don’t even get me started on canola. One wonders how raw materials which are so obviously not oily can produce so much oil at such reasonable prices. Shouldn’t they be even more expensive than olive oil? As a general rule, avoid whatever that needs a lot of engineering. Simple as that. Thanks for your info, Khew. I love chicken livers. In a recent trip to visit a friend in Sydney, I went to a Szechuan restaurant and ordered a plate of it. Saw the chef prepare the livers: fresh (at least they look fresh) and patted dry with a paper towel. Sauteed on very high heat, salt and pepper, lots of dried chillies. No more than a minute and it was ready. And delicious!